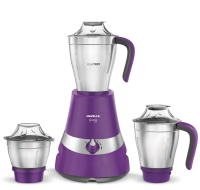 Havells mixer grinder has 750 watts copper winded motors. It comes with unique design air duct for enhancing motor life and reduction of motor noise. This mixer grinder comes with dry grinding,wet grinding & mixing ,chutney making functions. To Recieve updates and possible rewards for Havells Gracia (Grey) please sign in. To Recieve updates and possible rewards for Juicer Mixer Grinder (JMG) please sign in.